The Earth is in danger of reaching a point of no return where global temperatures cannot be contained by humans. This is one of the conclusions from a new study led by the independent Stockholm Resilience Centre. Researchers looked at a number of tipping points which will exacerbate the rise in global temperatures. These mean existing stores of carbon will be released into the atmosphere as the Earth gets warmer. The study is a new articulation of what scientists have long discussed and fretted about; namely, the stage at what climate change becomes irreversible. The loss of sea ice at both poles, Amazon rainforest dieback, and increased ocean acidification were among 10 processes the researchers analysed which could play an unstable role in the future. "Our study suggests that human-induced global warming of 2°C may trigger other Earth system processes, often called “feedbacks”, that can drive further warming - even if we stop emitting greenhouse gases," said lead author Will Steffen from the Australian National University and Stockholm Resilience Centre. Global temperatures have increased by 1°C since pre-industrial times, meaning that ice sheets, coral reefs, and Arctic summer sea ice are already within risk of change. The Paris climate agreement commits all nations to reduce global temperatures to well below 2°C, and to aim for 1.5°C. The academics stressed that it remains unknown how close to 2°C the climate can increase before the system is pushed too far. "These tipping elements can potentially act like a row of dominoes. Once one is pushed over, it pushes Earth towards another. It may be very difficult or impossible to stop the whole row of dominoes from tumbling over. 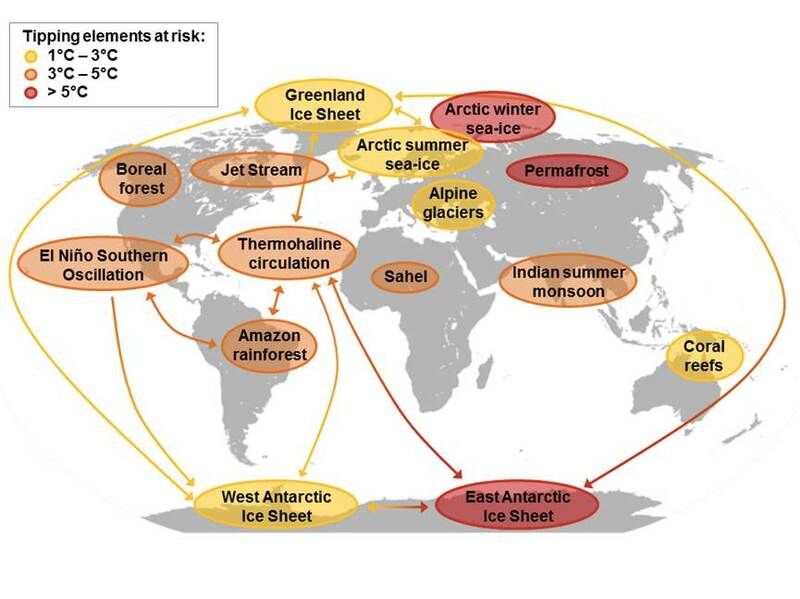 Places on Earth will become uninhabitable if Hothouse Earth becomes the reality," warned co-author Johan Rockström. The so-called hothouse scenario sees global temperatures stabilise at between 4°C-5°C, representing an increase in sea levels up to 60m higher than today. The academics concluded that avoiding this outcome will require a wholesale change in the way societies operate, transitioning to an emissions-free world as soon as possible. The article was published in the Proceedings of the National Academy of Sciences.